Be the first to share your favorite memory, photo or story of Mae . This memorial page is dedicated for family, friends and future generations to celebrate the life of their loved one. 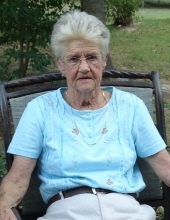 Mrs. Mae Horton, age 86, of Rockmart, GA passed away at her residence on Tuesday, November 27, 2018. She was born in Gadsden, Alabama on August 13, 1932 a daughter of the late John Maton and the late Annie McCormick Maton. Mrs. Horton had lived the greater part of her life in Rockmart and retired from Engineered Fabrics where she worked for twenty years. She was of the Methodist faith. Mrs. Horton enjoyed fishing, shopping yard sales and her dogs. She loved life, especially spending time with family and friends. In addition to her parents she was preceded in death by her husband, Herbert "Red" Horton; two daughters: Betty Stegall and Denise Horton and by two brothers: Willard and L.D. Maton. Survivors include a daughter, Shelia (Mike) Smith, Rockmart; sister, Christine (M.J.) Locklear, Dallas; six grandchildren; 16 great grandchildren and several nieces and nephews. Funeral services will be held Thursday, November 29, 2018 at 2:00 pm in the chapel of the Alvis Miller & Son Funeral Home with Rev. Barry Snapp officiating. Interment will follow in the Rose Hill Cemetery. Pallbearers will include: Adam Smith, Scotty Stegall, Dusty Cole, Britt Earwood, Ricky Lester and Joe Forsyth. Mike Smith will serve as an honorary pallbearer. The family will receive friends Thursday from 12 noon until the funeral hour at the funeral home. The Alvis Miller & Son Funeral Home is in charge of arrangements for the funeral of Mrs. Mae Horton. To send flowers or a remembrance gift to the family of Mae Horton, please visit our Tribute Store. "Email Address" would like to share the life celebration of Mae Horton. Click on the "link" to go to share a favorite memory or leave a condolence message for the family.